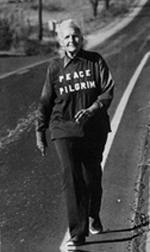 Her friends put together a website and a book: Peace Pilgrim: Her Life and Work in Her Own Words. At the website you can read most of the book online or ask that a hard copy be sent to you. There is an hour long documentary to download, interviews and a 2006 calendar to download. The peace pilgrim pamphlet called the “The steps to inner peace�? can be read at and is offered in 8 different languages on the web site, as well. You can also request a hard copy be sent to you. Next Next post: Ponderosa Pine needles cause abortion… and prevent scurvy.